Battening down the hatches once again for a gale 9, storm 10 northerly overnight, thanking the good Lord I'm not on the boat out of Aberdeen, which even as I type is smashing headlong into it. Susan's heading south tomorrow night, full of trepidation, but the forecast is for easing winds down to six or seven. Couple of Phenergan and she should be fine. The last overnight storm, of course, claimed the Anstruther fishing boat Meridian, and her crew. The boat was on pipeline patrol duty in the Norwegian sector of the North Sea. This meant she was contractually unable to run for harbour, as any vessel of her size would normally have done had she been fishing. She was just a wee wooden thing, though perhaps I've had my perspective affected by the massive supertrawlers common in Shetland, like the Altaire. In the early days of North Sea oil, all kinds of fishing boats were pressed into service as 'stand-by vessels'. I thought that, since Piper Alpha, there had been restrictions brought in on the kind of vessels that could be used, at least in the UK sector. I always thought the regulations in the Norwegian fields were even stricter. Another thing: while I have tremendous sympathy for the families of the lost seamen, and can understand their need for 'closure', I am very unsure about these demands to find and raise lost fishing boats, and bury any casualties on land. Is it just the availability of technology to do so that has brought these deep-seated needs into the open, or has there been a sea-change in the traditional stoicism of fishing communities? Thursday was wild. Storm force 10, gusting higher, and from an unusual direction, north east...during the day the sea was all spume, no waves...blown flat. It's a long time since I've seen waterfalls blown backwards, or waves breaking over the Mavis Grind. The power failed two minutes after the programme finished, and was off for four hours...came back on, then off again for a couple of hours. Candles, generator (10 years old, still going strong though the carb's leaking petrol; thank you Mr Honda). 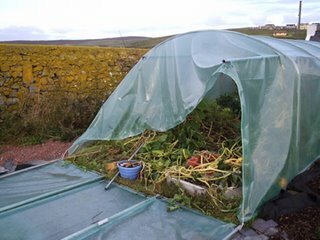 Next day, this morning, was calm and beautiful.Time to inspect the damage - a ripped'n'torn polytunnel and the satellite dish mounting (very rusty) snapped. Running repairs and ready for more wind (though not so bad) tonight. The hatches are being battened down. It's the equinoctials. Please buy this hotel and give Northmavine a bar! Although to be honest I'm not sure if it's even for sale. I've posted about the increasingly derelict, empty for two years, St Magnus Bay Hotel, which is in our township, before. It's historically important, wooden, beautiful, listed, and was shipped to Shetland on a barge after being dismantled in Glasgow, where it was the Norwegian display at the Great International Exhibition of 1901. It's (apparently) owned by a south company called Canterbury Travel, who so far to have shown no interest in selling it to various interested parties, preferring instead to allow it to decay. 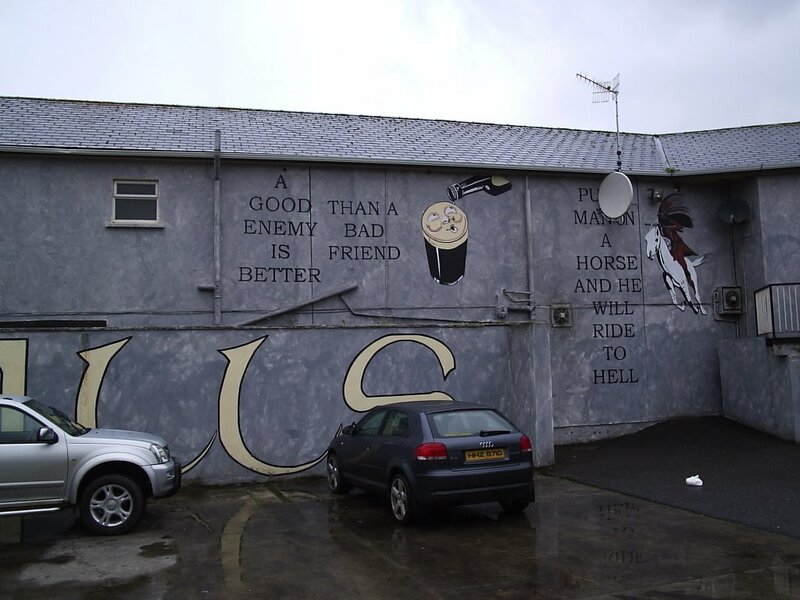 There is now no bar in Northmavine, except for those in the public halls. 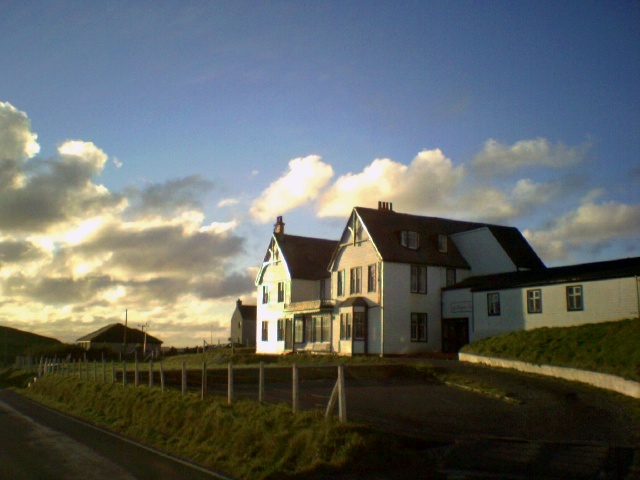 When I first moved here there were three - The Crofter's Arms in Ollaberry, the Booth in Hillswick, and the Hotel. Local development company Initiative at the Edge is pursuing the option of community ownership, but that seems a veryu long way off. Meanwhile, vandals and trespassers are being seen inside the hotel more and more often. Somebody save it! Think of the grants! That has to be one of Springsteen's more ridiculous lines...'the dogs on Main Street howl, 'cause they understand...' But then so much of what I once loved and was thrilled by in early-to-mid-period Bruce now seems like the most cringe-inducing, breast-beating romantic posturing. Anyway, I didn't set out to dwell on things Bruceian, but to say this: I have vacuumed the kitchen four times today. Lulu is moulting, and hair is blowing like tumbleweed through the house. A large chunk of the family is due home tomorrow off the boat, and that means an early rise tomorrow to try and clear out some more extraneous dog pelt. Might be a rough night on the boat, coming north into the teeth of a north-easterly equinoctial. 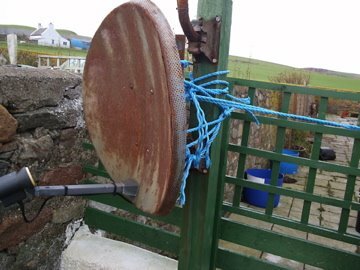 Terrible weather in Shetland this last 48 hours, with mayhem at Sumburgh due to fog, flights galore cancelled. It'll be good to have the house occupied by other than me and the dogs, though I've been wallowing this past week in the third series of Northern Exposure, now out on DVD (though with really crap music instead of the original, exemplary soundtrack). Easy to see the line of inheritance from NE to The Sopranos, whose creator, David Chase, was series producer on NE, though for some reason uncredited. And he seems to diss the series at every opportunity. Maybe that Esalen Institute/dream/flashback/Freud stuff the two series have in common is wee bit too much for him to admit. An old friend once described Northern Exposure as 'that happy programme', and it's true there is no tragedy in it. Some of it is tremendously moving, though (series three Yule show, for example. I just need to hear the theme music to feel a warm glow. Anyway, using the gloriously outmoded (in every respect but live remote radio broadcasting) ISDN digital phone system, also known as BT Business Highway, a lovely old AKG D202 microphone (good enough for the House of Commons, mate)an ex-Grampian TV Musicam codec (don't ask; it's a couple of black boxes), an uninterruptible power supply off eBay, loads of dodgy wiring and a tiny Alesis mixer (plus a whole heap of record decks, CD players and other stuff off eBay), this is where the world's most geographically remote national and international daily radio show comes from. 'Let them have builders' is allegedly an ancient Chinese curse, but for us, having brothers Donald and Tom completely re-roof the L-shaped (and B-listed) steading in the grounds of the manse has been a pleasure and a privilege. 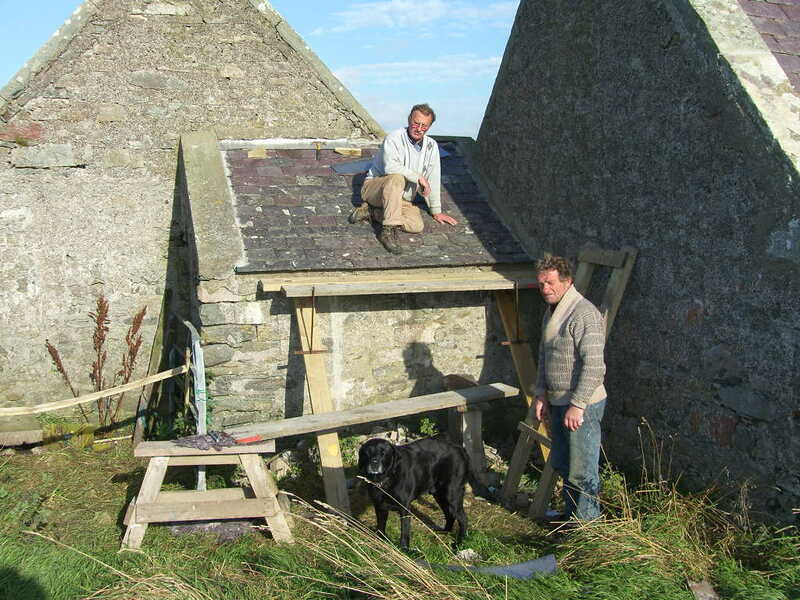 They came from Cromarty in the Black Isle, and in five straight weeks they removed all the slates from the two barns, demolished one entire roof which turned out to be beyond salvage, cut to size and rebuilt the rotten roof from scratch, including erecting new beams and sarking. All this for several thousands of pounds less than the cheapest quote we could get from any Shetland firm. And that includes flights, new slates, accommodation and providing them with a car (not a very good car, it must be admitted). During their stay, Tom and Donald were adopted by our labrador Quoyle, who accompanied them all day, in the hope of lunchtime treats. 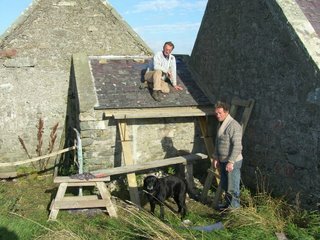 Here they are on the second last day, finishing off the tiny sheep shed (which we didn't expect to get done at all). 'We were lucky with the weather' said Donald. 'And if we hadn;t worked until 7 every night, we wouldn;t have made it.' But they did, and we're grateful. 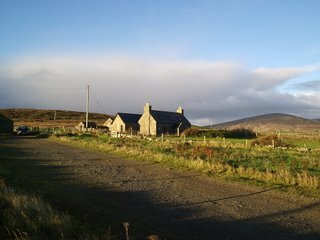 The plan is to convert one barn into a broadcast studio, office and recording space, and the other into self-catering accommodation. Watch this space! ...is the name of an old We Free Kings song, and it seems appropriate that, after publicly declaring my motorbikin' career over, it should be gloweringly, viciously, Shetlandicly soaking the day I pick up a 1980 BMW R80/7, 26 years old and only 28,500 miles on the clock. 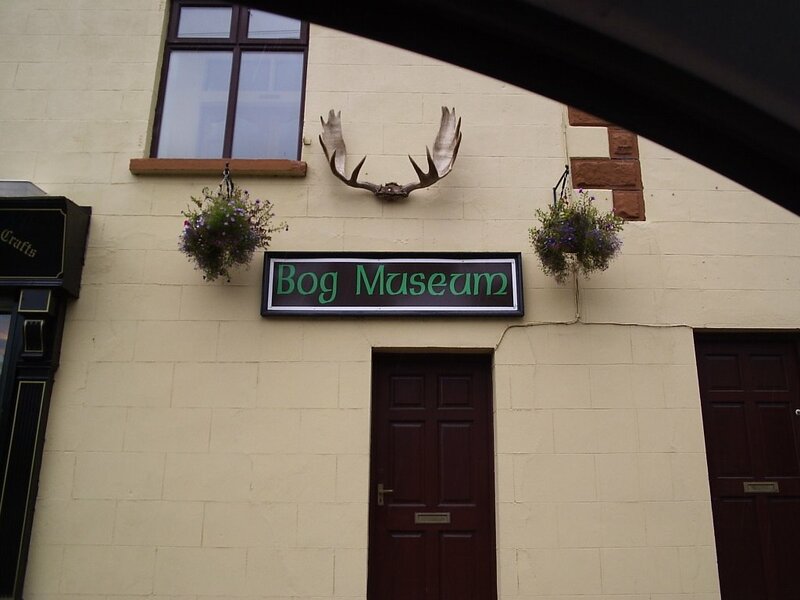 Alas, the Bog Museum in Coalisland was shut when Martha and I passed through on the way to Sandy and Elaine's wedding. 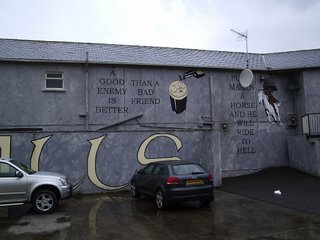 We did have a coffee in one of the local cafes, and checked out some of the, ahem, somewhat interesting murals before heading to Stewartstown and a truly lovely service. Memo to self: Learn how to do a Strip the Willow properly so as to avoid future embarrassment.